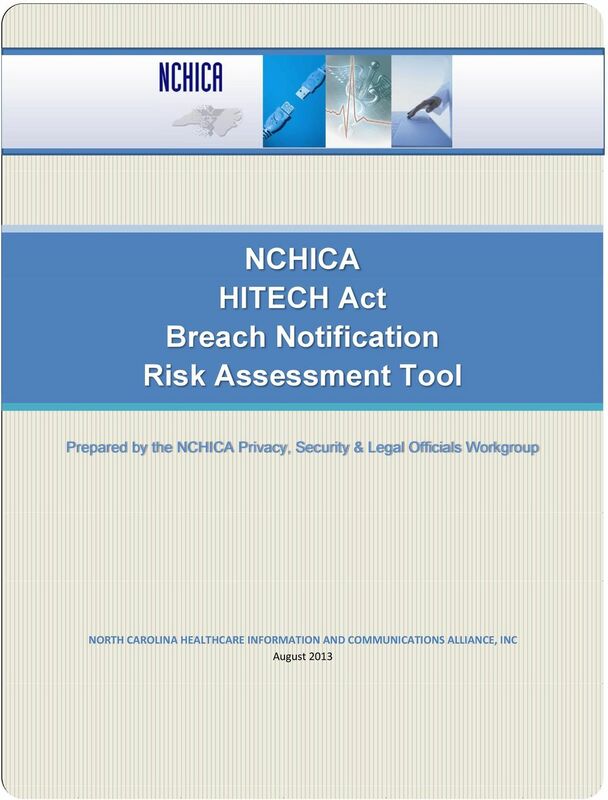 Download "NCHICA HITECH Act Breach Notification Risk Assessment Tool. Prepared by the NCHICA Privacy, Security & Legal Officials Workgroup"
2 NCHICA HITECH Act Breach Notification Risk Assessment Tool Prepared by the NCHICA Privacy, Security & Legal Officials Workgroup August 2013 This document may be modified and used by any organization so long as the copyright legend is retained and attribution to NCHICA as the source is provided. 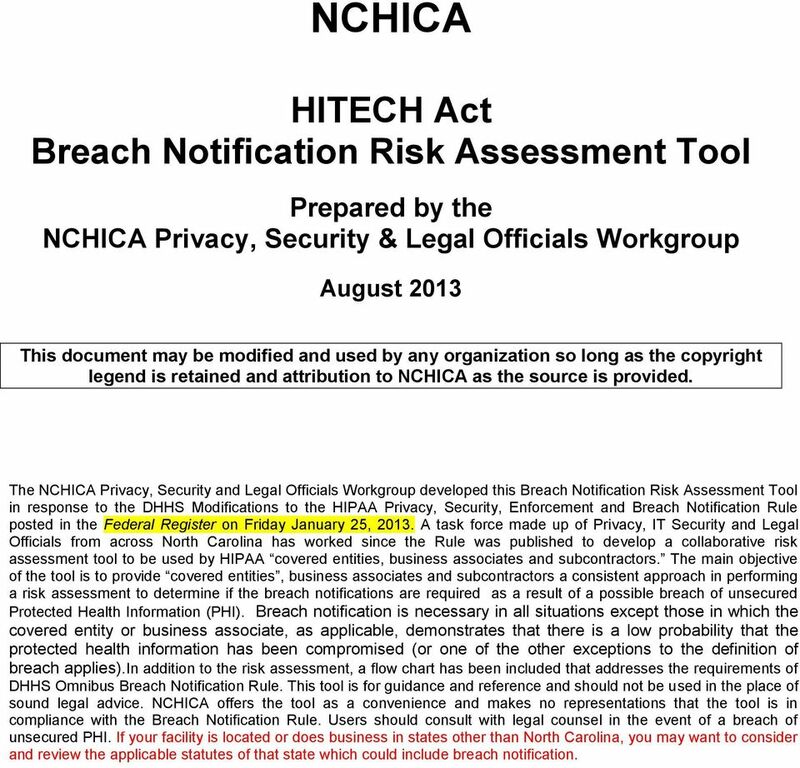 The NCHICA Privacy, Security and Legal Officials Workgroup developed this Breach Notification Risk Assessment Tool in response to the DHHS Modifications to the HIPAA Privacy, Security, Enforcement and Breach Notification Rule posted in the Federal Register on Friday January 25, A task force made up of Privacy, IT Security and Legal Officials from across North Carolina has worked since the Rule was published to develop a collaborative risk assessment tool to be used by HIPAA covered entities, business associates and subcontractors. The main objective of the tool is to provide covered entities, business associates and subcontractors a consistent approach in performing a risk assessment to determine if the breach notifications are required as a result of a possible breach of unsecured Protected Health Information (PHI). 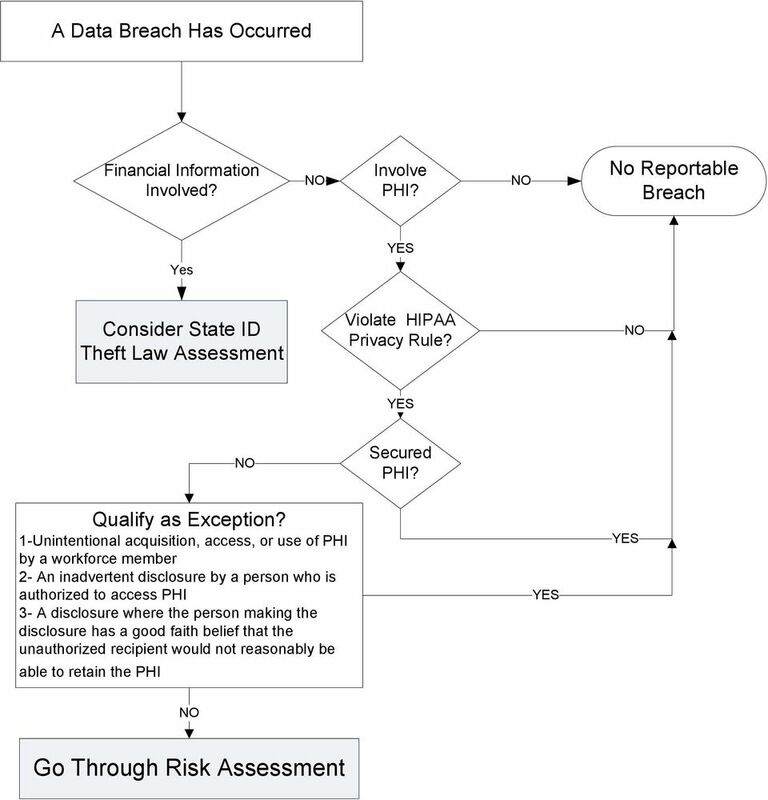 Breach notification is necessary in all situations except those in which the covered entity or business associate, as applicable, demonstrates that there is a low probability that the protected health information has been compromised (or one of the other exceptions to the definition of breach applies).in addition to the risk assessment, a flow chart has been included that addresses the requirements of DHHS Omnibus Breach Notification Rule. This tool is for guidance and reference and should not be used in the place of sound legal advice. NCHICA offers the tool as a convenience and makes no representations that the tool is in compliance with the Breach Notification Rule. 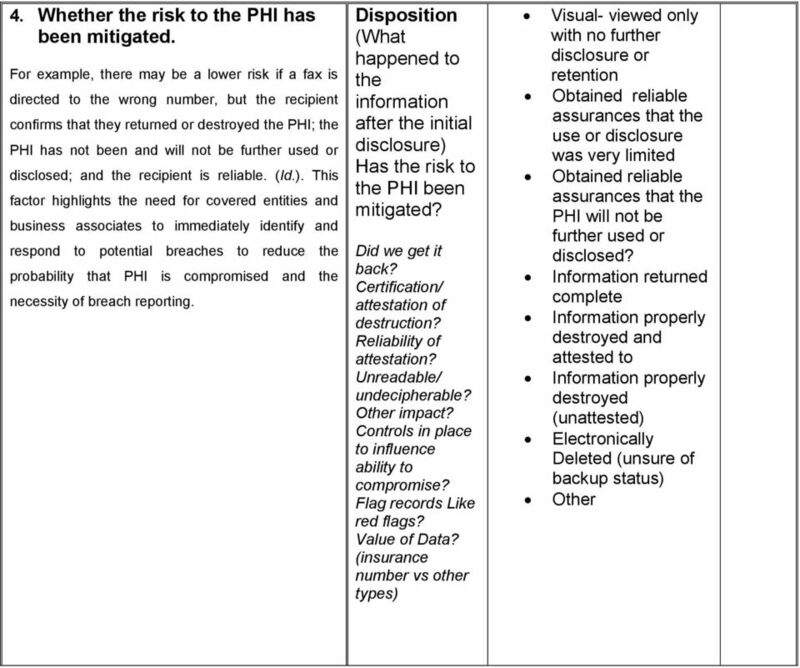 Users should consult with legal counsel in the event of a breach of unsecured PHI. If your facility is located or does business in states other than North Carolina, you may want to consider and review the applicable statutes of that state which could include breach notification. 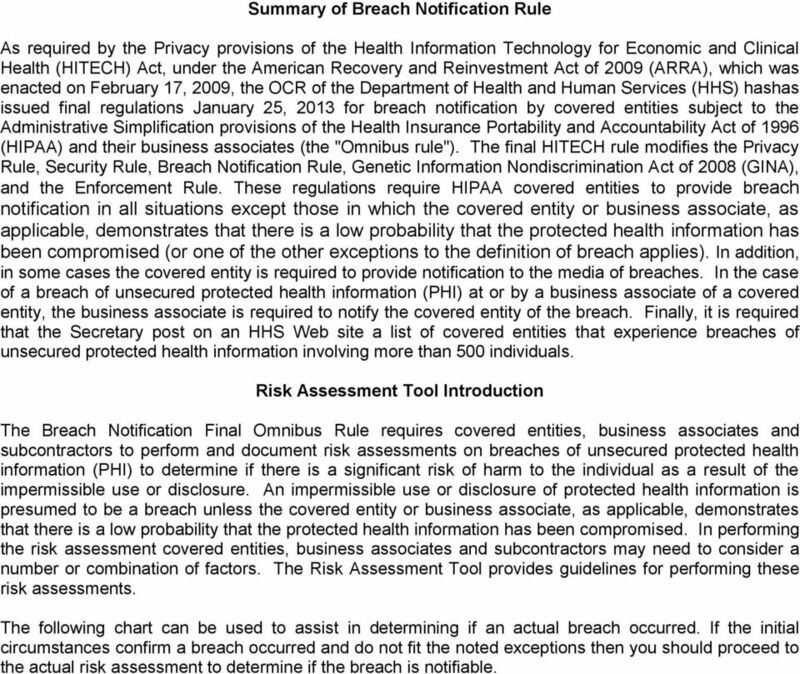 3 Summary of Breach Notification Rule As required by the Privacy provisions of the Health Information Technology for Economic and Clinical Health (HITECH) Act, under the American Recovery and Reinvestment Act of 2009 (ARRA), which was enacted on February 17, 2009, the OCR of the Department of Health and Human Services (HHS) hashas issued final regulations January 25, 2013 for breach notification by covered entities subject to the Administrative Simplification provisions of the Health Insurance Portability and Accountability Act of 1996 (HIPAA) and their business associates (the "Omnibus rule"). The final HITECH rule modifies the Privacy Rule, Security Rule, Breach Notification Rule, Genetic Information Nondiscrimination Act of 2008 (GINA), and the Enforcement Rule. 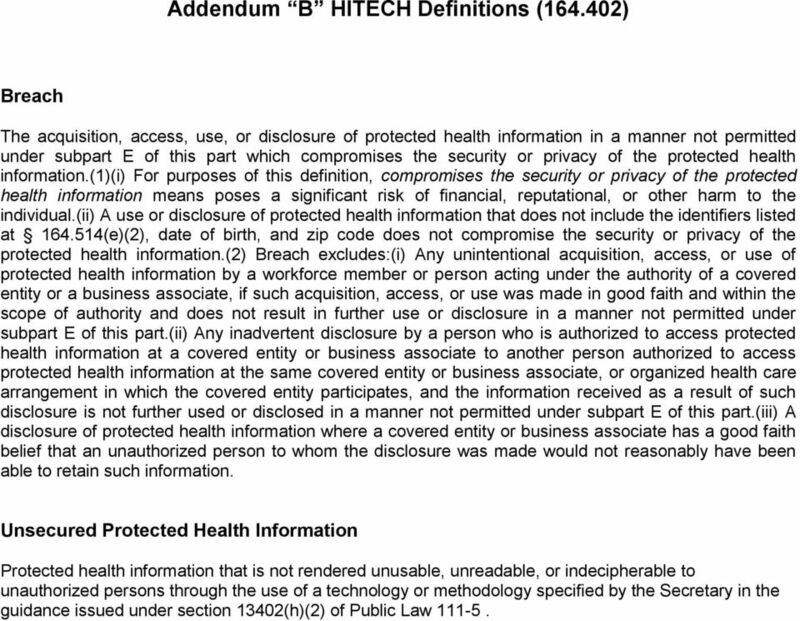 These regulations require HIPAA covered entities to provide breach notification in all situations except those in which the covered entity or business associate, as applicable, demonstrates that there is a low probability that the protected health information has been compromised (or one of the other exceptions to the definition of breach applies). In addition, in some cases the covered entity is required to provide notification to the media of breaches. In the case of a breach of unsecured protected health information (PHI) at or by a business associate of a covered entity, the business associate is required to notify the covered entity of the breach. Finally, it is required that the Secretary post on an HHS Web site a list of covered entities that experience breaches of unsecured protected health information involving more than 500 individuals. Risk Assessment Tool Introduction The Breach Notification Final Omnibus Rule requires covered entities, business associates and subcontractors to perform and document risk assessments on breaches of unsecured protected health information (PHI) to determine if there is a significant risk of harm to the individual as a result of the impermissible use or disclosure. An impermissible use or disclosure of protected health information is presumed to be a breach unless the covered entity or business associate, as applicable, demonstrates that there is a low probability that the protected health information has been compromised. In performing the risk assessment covered entities, business associates and subcontractors may need to consider a number or combination of factors. The Risk Assessment Tool provides guidelines for performing these risk assessments. 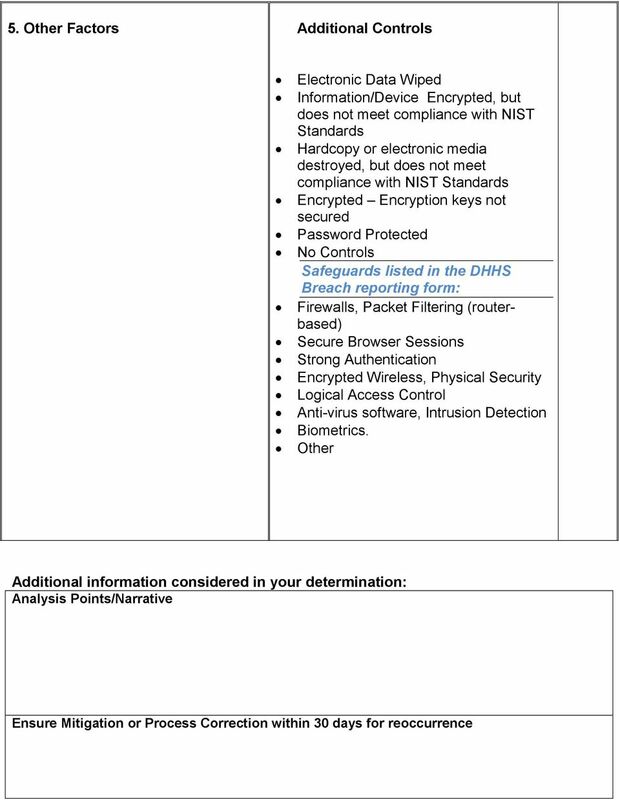 The following chart can be used to assist in determining if an actual breach occurred. If the initial circumstances confirm a breach occurred and do not fit the noted exceptions then you should proceed to the actual risk assessment to determine if the breach is notifiable. 5 NCHICA Breach Notification Risk Assessment Tool Incident/File/Name Event Date Number of individuals affected Discovery Date Point of Contact Phone # Brief Summary/Findings Final Decision Source of Incident: Who was responsible for the inappropriate acquisition, access, use or disclosure (incident)? Circle your answer If a Business Associate or subcontractor is the source of the incident, enter the date the Business Associate or their Business Associate made you aware of incident. Is there a BAA or other agreement in place? Have they performed a breach assessment of their own? Have any notifications been made by the BA or subcontractor? Are you the Business Associate or subcontractor? Circle your answer When was it discovered or when should it have been discovered? If you are the Business Associate or subcontractor, enter the date you notified the other Covered Entity of the incident Enter the date that our organization became aware of the incident Date: Internal to Your organization or Business Associate Yes/No Yes/No Yes/No Yes / No Date: Date: Date: Section (a)(2) further provides that a covered entity is deemed to have knowledge of a breach if such breach is known, or by exercising reasonable diligence would have been known, to any person, other than the person committing the breach, who is a workforce member or agent of the covered entity (determined in accordance with the federal common law of agency). 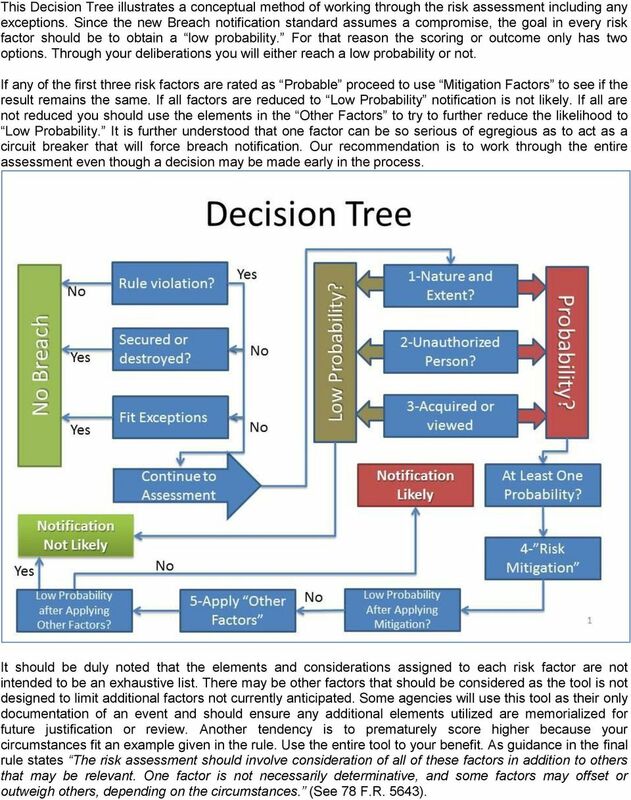 6 This Decision Tree illustrates a conceptual method of working through the risk assessment including any exceptions. Since the new Breach notification standard assumes a compromise, the goal in every risk factor should be to obtain a low probability. For that reason the scoring or outcome only has two options. Through your deliberations you will either reach a low probability or not. If any of the first three risk factors are rated as Probable proceed to use Mitigation Factors to see if the result remains the same. If all factors are reduced to Low Probability notification is not likely. If all are not reduced you should use the elements in the Factors to try to further reduce the likelihood to Low Probability. It is further understood that one factor can be so serious of egregious as to act as a circuit breaker that will force breach notification. Our recommendation is to work through the entire assessment even though a decision may be made early in the process. It should be duly noted that the elements and considerations assigned to each risk factor are not intended to be an exhaustive list. There may be other factors that should be considered as the tool is not designed to limit additional factors not currently anticipated. Some agencies will use this tool as their only documentation of an event and should ensure any additional elements utilized are memorialized for future justification or review. Another tendency is to prematurely score higher because your circumstances fit an example given in the rule. Use the entire tool to your benefit. As guidance in the final rule states The risk assessment should involve consideration of all of these factors in addition to others that may be relevant. One factor is not necessarily determinative, and some factors may offset or outweigh others, depending on the circumstances. (See 78 F.R. 5643). 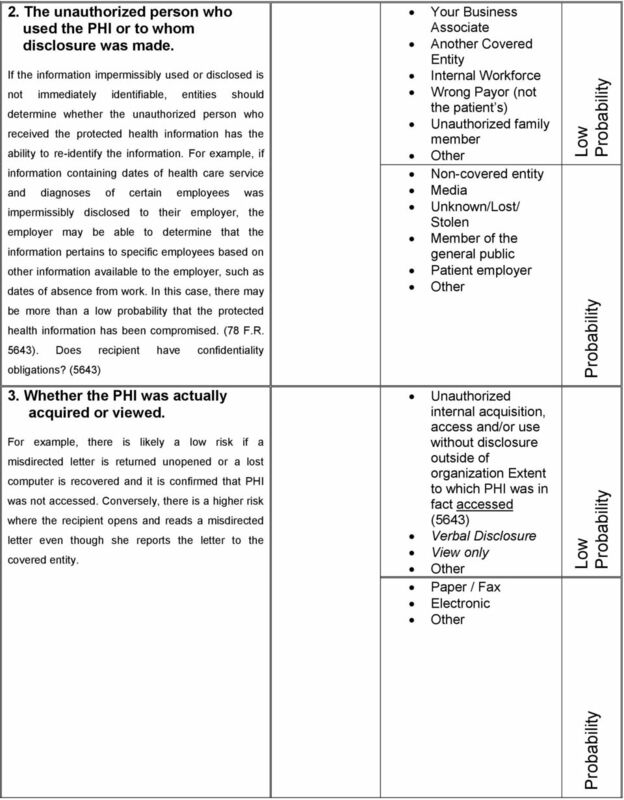 12 SCORING If the entity concludes that the risk assessment demonstrates a low probability that the PHI has been compromised, the entity should document its analysis and may forego breach notification. 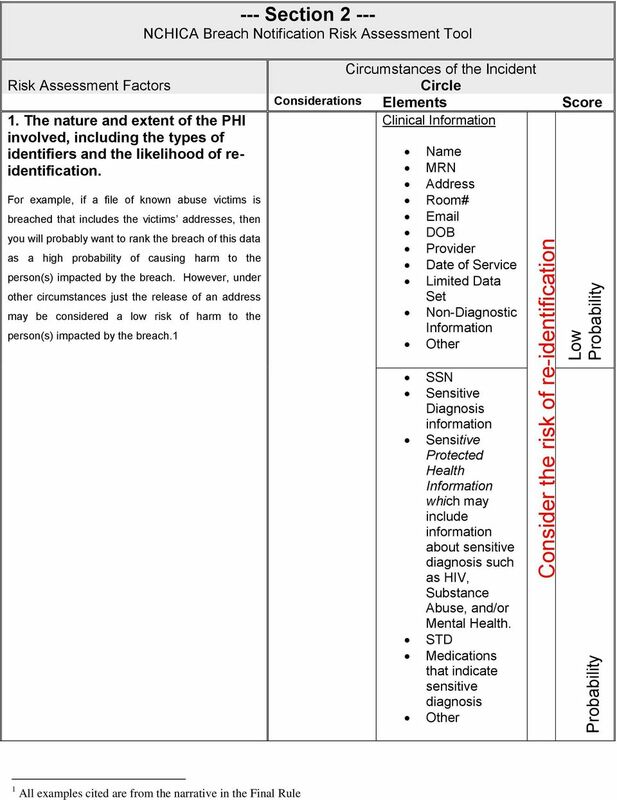 On the other hand, if the risk assessment fails to demonstrate a low probability that the PHI has been compromised, the entity is required to report the breach unless one of the regulatory exceptions applies. The scoring is meant to serve only as a guide in decision making and not designed to make the notification decision for you. There are a variety of factors and mitigations that may be involved in your incident that this tool may not foresee or predict. 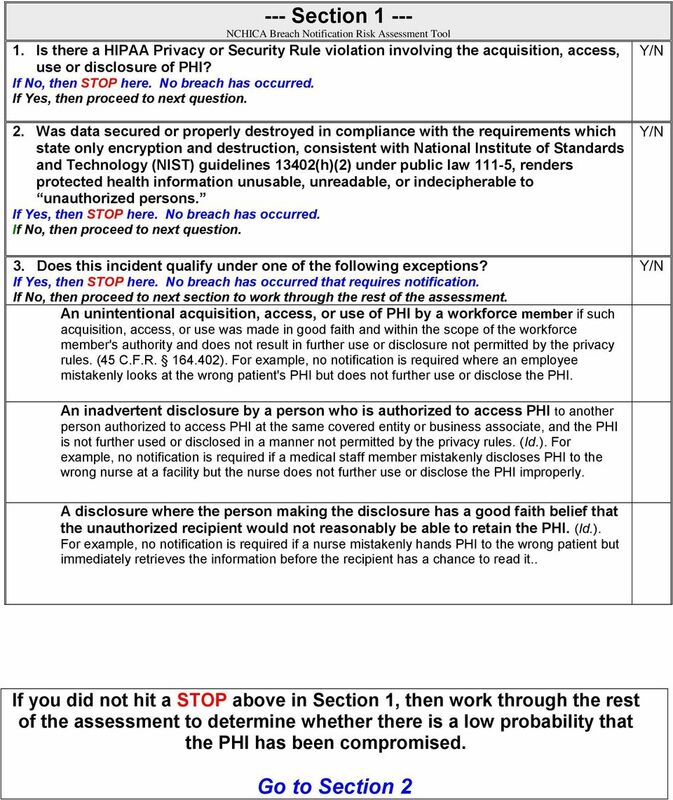 An attempt was made to develop this is a way that would help you in documenting your actions, consider risk factors and circumstances and then aid in your final decision of making a breach notification or not making a breach notification. There is no scoring element for factors #4 and #5 as they were considered mitigation factors as opposed to risk factors. The scoring is designed to be subjective enough so that each entity can consider their own policies, technical safeguards/constraints, mitigation strategies, interpretation and details specific to the specific incident they are reviewing. The risk factors carry a possible outcome of Low Probability or Probability. Probability of Compromised Information Low Probability High Probability Notification Unlikely Articulate and Document Decision Notification Likely To Notify or Not Breach notification is necessary in all situations except those in which the covered entity or business associate, as applicable, demonstrates that there is a low probability that the protected health information has been compromised.